You don’t have to travel far to learn about ecological gardening. The North Carolina Botanical Garden in Chapel Hill showcases a number of ways to help the planet. Cisterns furnish water to the native plants. Rain gardens, retention swales and drainable paving further control flow of water. Locally sourced materials compose the walkways and bedding structures. 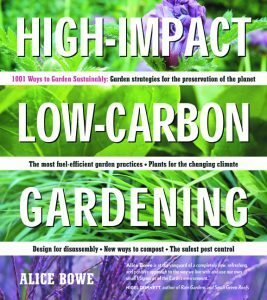 You can learn even more ways to change your own garden into a more earth-friendly environment by reading High-Impact, Low-Carbon Gardening (Timber Press). In the book’s first half, one is introduced to the environmental strengths and weaknesses of various gardening materials. As an example, concrete and cement are considered a poor choice when compared to local stone or gravel. The assets of water saving devices, of various types of compost, and of fences and hedges are also discussed. Each suggested product, such as environmentally friendly exterior paint, is listed with both an American and a British company as sources. 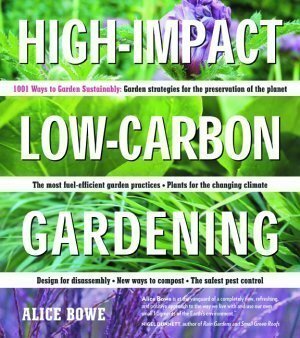 Although I learned much about possible ecological alterations to add to an established garden like mine, the chapters on plants were the most interesting to me. She states logical solutions to diminish the water required for plant care, such as grouping together plants with not only the same light needs, but also with similar water needs. For help in identifying plants that can withstand drought, their characteristics such as fleshy foliage are listed. I was fascinated to learn that if these plants possess an aromatic scent, it consists of an oil secretion that actually reduces evaporation. She lists types of “bimodal” plants, which she defines as coping “with more than one type of weather extreme,” that will thrive in predicted climate changes.